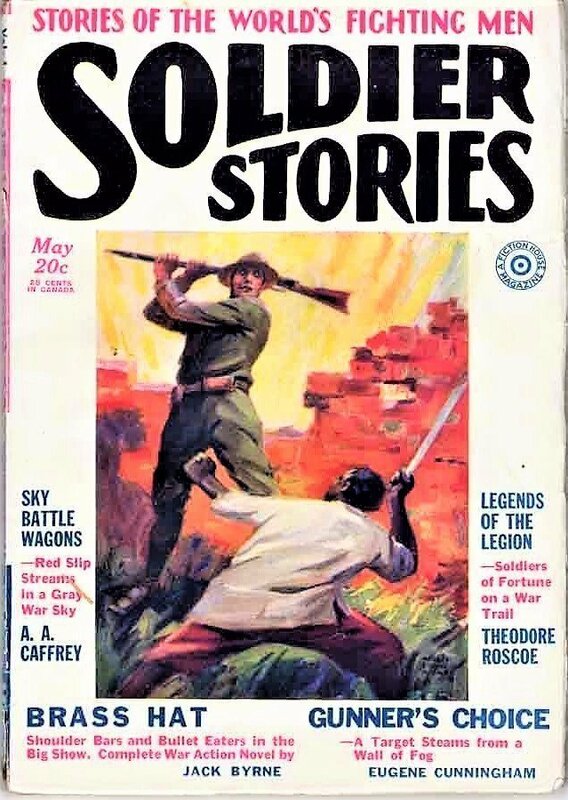 SOLDIER STORIES – April 1929 recently sold on eBay for $429.24. 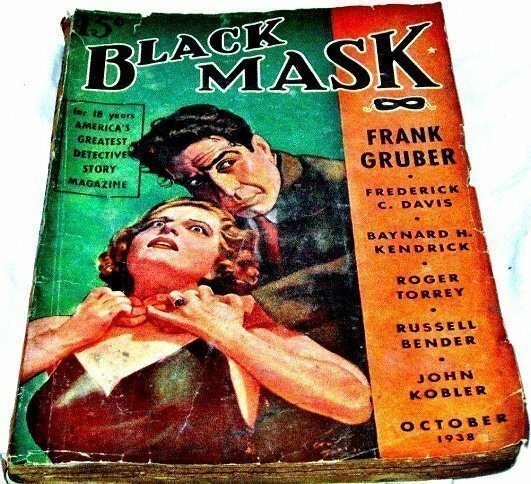 This is the First Issue of just 4 of this Fiction House title. 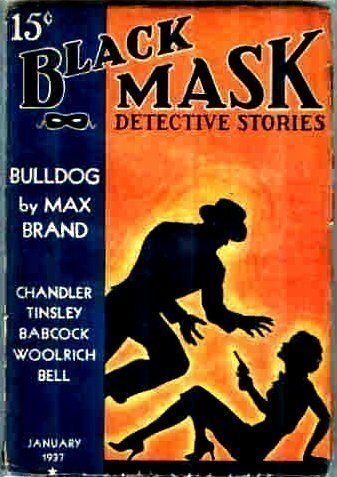 It would morph into DETECTIVE CLASSICS for the later 22 issues. TWO INCHES MISSING FROM SPINE AT BOTTOM. BACK COVER LIGHTLY SOILED. PIECE OUT OF PULP AT BOTTOM NEAR SPINE. 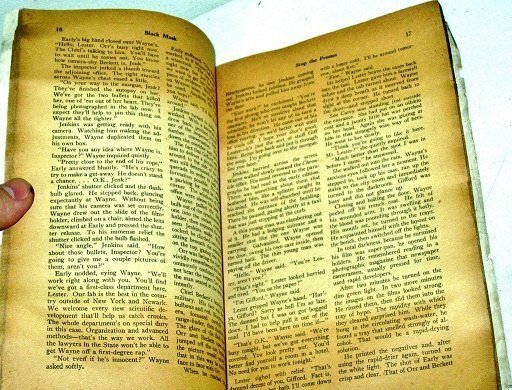 PAGES ARE TAN AROUND THE EDGES. 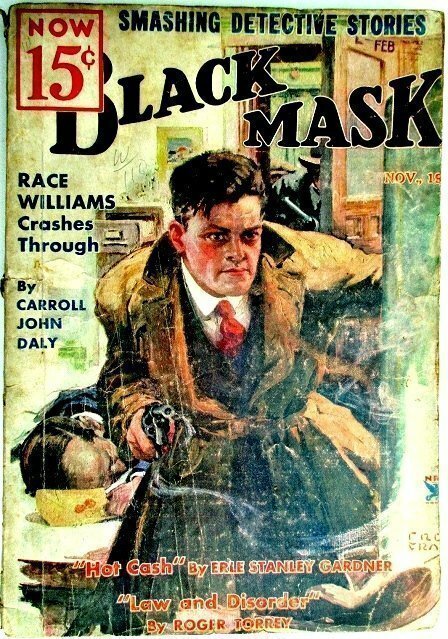 Cover Artist: H.C. Murphy Jr. (and here) (who died January 1, 1931 at 45 of cancer). 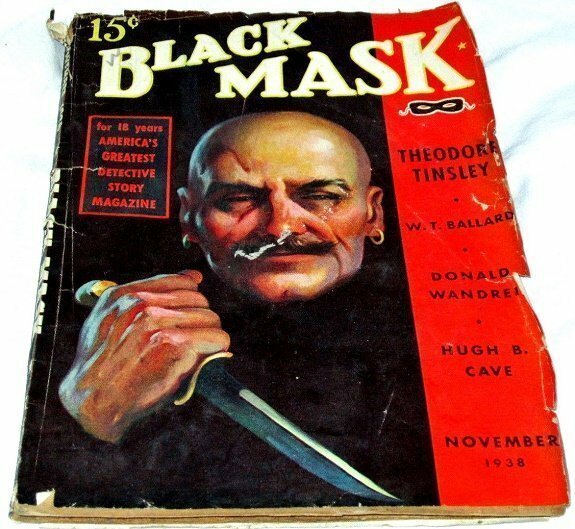 Murphy Jr. did 38 covers for ADVENTURE in the 1920’s (and one showed up on a 1933 issue) and at least 9 BLACK MASK in the same years. 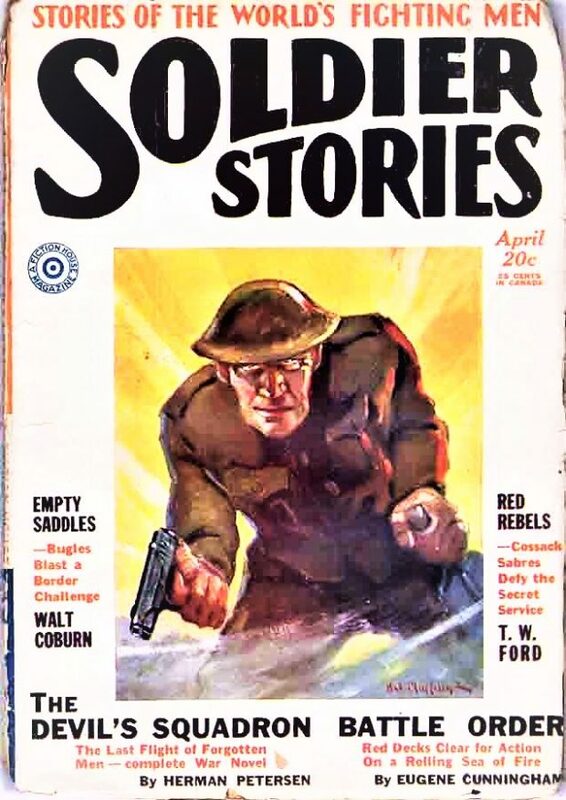 He did some really sparse covers paintings, a few nicer Westerns and Northwest Mounties, but his forte were the many excellent Clipper ship covers. 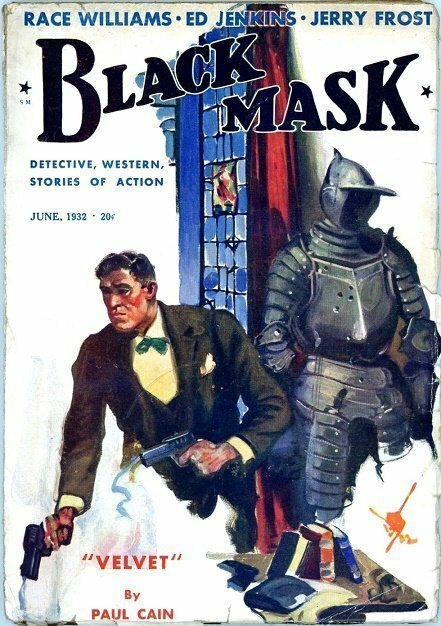 2 for DETECTIVE-DRAGNET MAGAZINE, and 1 for The UNDERWORLD MAGAZINE. (If you check the FictionMags Index and ever find an author missing from the contents list (like only one here) that is because I didn’t think they were prolific enough to list). “A COMPLETE VERY GOOD COPY. USUAL FOLDS AND CREASES ALONG EDGES OF COVERS. ONE INCH TEAR AT MIDDLE OF FRONT COVER OUTER EDGE. BOTTOM OUTER CORNER IS ROUNDED. TEARS AT TOP AND BOTTOM OF SPINE. 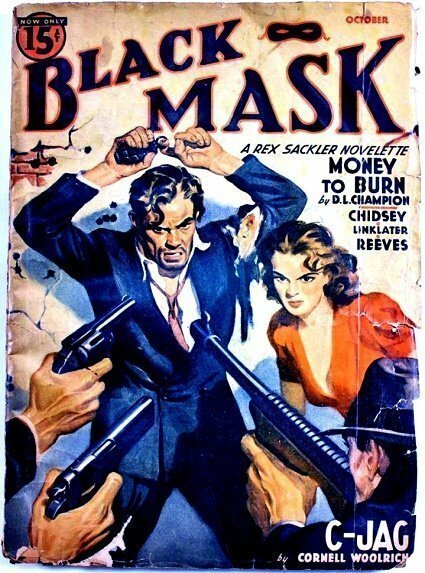 I would place them from “Scarce,” but much more closer to “Rare.” The title never shows up for sale and the winning bids seem indicative for “Rare” titles, especially for a Fiction House Pulp which are usually easier to pick up. 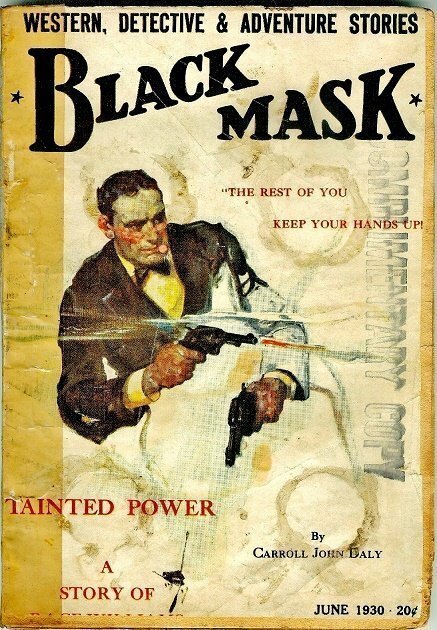 For some recent Pulp sales we follow the gun-powder smell over to BLACK MASK and see ten arresting prices. If it wasn’t stated before, the quotation marks on the condition were the dealers description of issue in question. Sometimes they only state “Good shape” or “As shown in pics,” which usually isn’t much to go on, especially if only the front cover is shown. 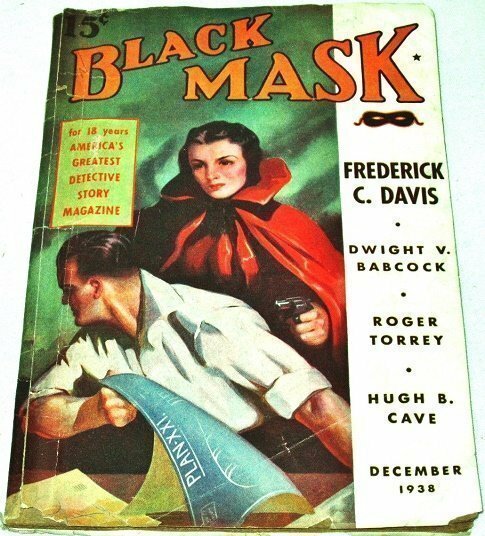 This issue has a lot of bad things going for it, except for the authors; Large “COMPLIMENTARY COPY” stamped on the cover, two round coffee (?) cup stains and dirty. “British Edition. 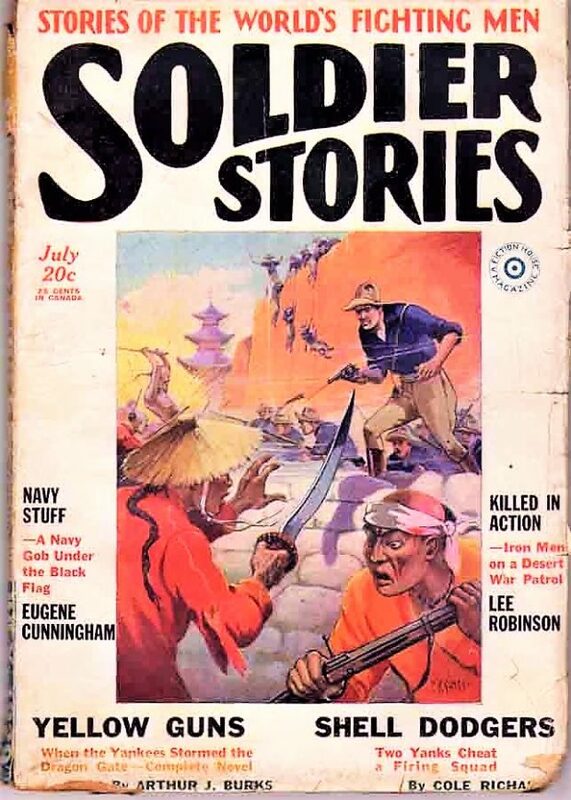 The stories and format are exactly the same as the American edition. 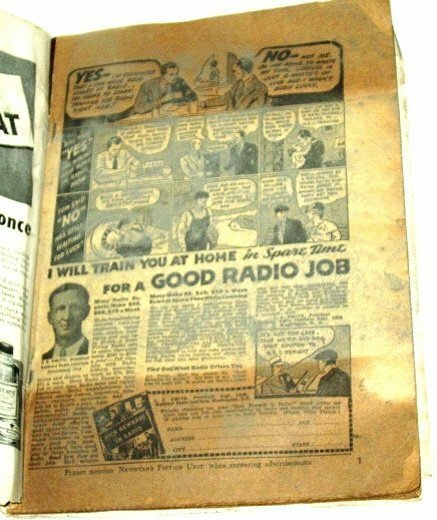 The ads on the inside front cover and both sides of the back cover have been replaced by ads of British merchants. The front cover is lightly soiled with moderate to heavy edge wear and reading creases along left edge. 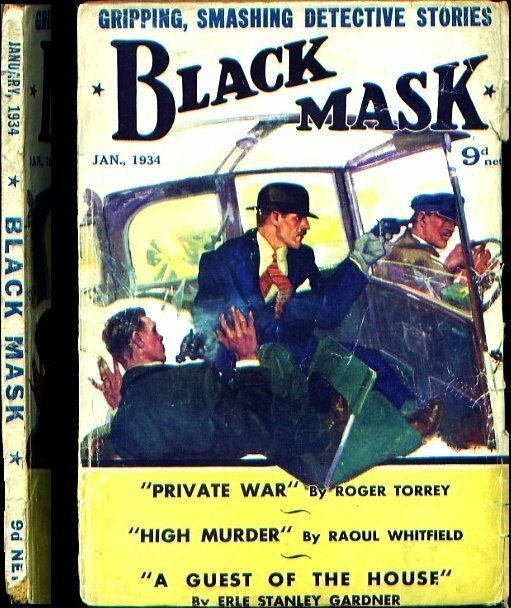 It’s Raymond Chandler’s final appearance in BLACK MASK and to make up for that it’s Cornell Woolrich first! This issue may have been returned because the same dealer listed another copy with the exact same cover, but added pictures of he inside pages. Unless this was a different issue but he re-used the same cover image for some reason. That one only sold for $19.50. The top and bottom pages are darkened/stained/foxed (?) like 2 1/2 – 3 inches on each side. However both buyers gave the dealer positive feedback so who knows.